COLUMBIA – A group of national champions attended the annual Show-Me State handball tournament Saturday. Wilson’s Fitness on Forum Boulevard held the tournament on the handball courts. Each person was awarded a certain number of points for each game. “I appreciate what really good handball is,” said Don Ginsburg, one of the tournament organizers. Three National Champions were in attendance, as well as one World Champion. “It’s always been something I’ve loved to do,” Max Langmack said. 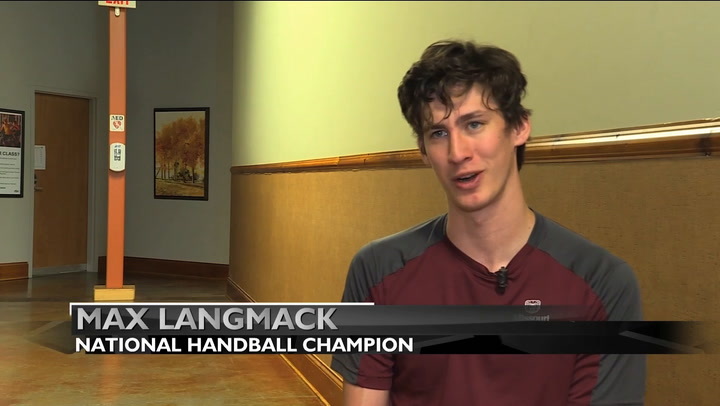 Langmack is a Kansas City native, but he just graduated from Missouri State University. He’s a national champion of the sport and will be on the Professional Handball Tour this year. According to Langmack, it was his best friend who introduced him to the sport. “We got on the courts, and I just loved it ever since,” he said. Langmack and the other National Champions agreed the sport was very family oriented. “It’s such a brotherhood,” he said. Jeff Streibig, a National Champion from St. Louis, said it was his father who got him into the sport. Now, he and his father will sometimes play together. “It’s amazing to get to spend time with your dad like that,” he said. Streibig’s father is a champion in his own right. He won the World Championship in 2009. Kevin Pettus, the third National Champion in attendance, said he was also introduced to the sport through his family. Both his grandfather and his father played handball. People of all ages attended the tournament, and some players even had children they said they hoped to introduce to the sport like their parents’ did.